Founded in 1932, Beech Aircraft Company was established by Walter Beech in Wichita. Beech had previous airplane manufacturing experience, beginning as a child when he created his first glider out of some wood and sheets. He later worked for Laird Swallow; but left the company to build his own planes with Lloyd Stearman and Clyde Cessna. Together they created Travel Air Manufacturing Company, and produced high wing monoplanes for private and business use. Eventually Cessna left the partnership, and Travel Air was purchased by Curtiss-Wright in 1930. Beech became president of the company and married Olive Ann Mellor. In 1932, at the height of the Great Depression, Beech chose to leave Travel Air and start his own company. He created Beech Aircraft along with his wife, Olive Ann Mellor Beech. Beech knew all aspects of aviation. The company's first objective was to build a five-seat biplane having the interior luxury of a fine sedan, top speed of 200 mph, landing speed no higher than 60 mph, non-stop range of 1, 000 miles, easy control, and sound aerodynamic characteristics. The competition considered these specifications unattainable. On November 14, 1932, Model 17R made its initial test flight and the impossible standards set by Beech had been met. Model 17R evolved into production model B17L. Almost every part for this model had been redesigned before it was put on the production line in 1934. The major innovation of the B17L was a negative staggered wing design, which improved control at all speeds, provided high visibility for pilots, and quick ground servicing. The other innovation of the B17L was its retractable landing gear, which reduced wind resistance and made emergency belly landings an added safety feature. A testimony to the high standards of the aircraft that Beech created is that many well-kept B17L biplanes continued to fly for many years. As World War II approached Beech was flooded with orders for his planes. While Beech recovered from major illness, Olive Ann ran the company during the war years. One of the main aircraft suppliers during the war, the company?s staff grew from 235 to more than 2,000. At the end of the war, however, Beech could no longer maintain such high numbers of workers. This reversed once again at the start of the Korean conflict. On November 29, 1950, Beech died of a heart attack. After his death, Olive Ann once again took over operations. One of few female chief executives in America, she grew the company to more than one million square feet of production space. 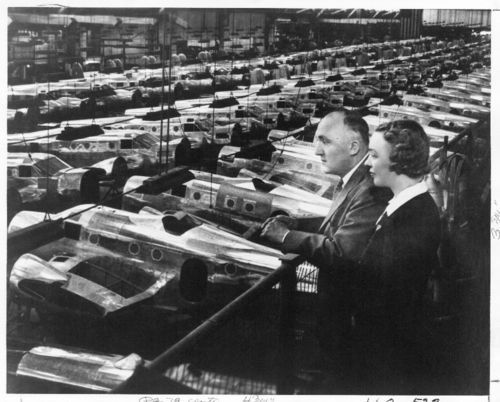 The company had 17 subsidiaries and 10 production plants producing aircraft for personal, business, and military use. During her nearly 20 years at the helm, sales tripled. Beech supplied products for NASA's Gemini, Apollo, and space shuttle programs. Beechcraft became a subsidiary of the Raytheon Company in 1980. In 1990 Raytheon merged the Wichita company with another of its product lines. In 2007 Hawker Beechcraft bought out the Raytheon division and began operating as its own company.